8.5x11, xxxix + 245 pp. Vecchi: Tich toch! Ch’èl quel? 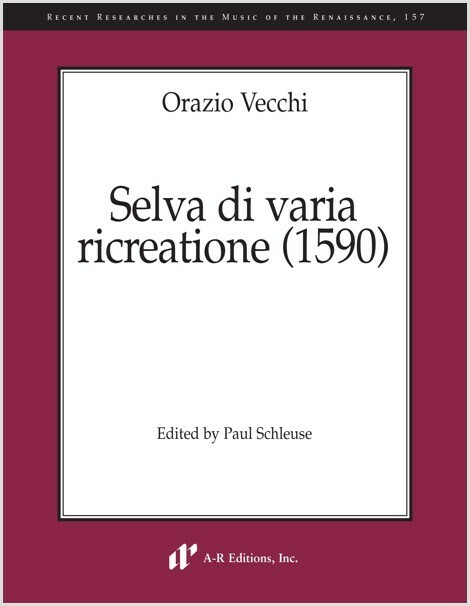 Orazio Vecchi’s Selva di varia ricreatione (1590) broke new ground in several respects. It was the first Italian print to contain secular polyphony for a wide variety of ensembles, ranging from three to ten voices or instruments, and its thirty-seven pieces include--extraordinarily--every established Italian secular genre of the day, with poetry believed to have been written almost entirely by the composer himself. These works include "serious" madrigals and dialogues in literary Tuscan, smaller-scale arias and canzonettas (provided with lute accompaniment), and witty vernacular pieces in several regional dialects and foreign languages. Vecchi explains both the size and variety of the collection by association with its title, likening the book to a forest in which a rich variety of foliage is a source of pleasure.